Galvalume is an aluminum-zinc coated steel that provides extra corrosion protection for our arch commercial steel buildings. The cost of Galvalume is about the same as that of galvanized steel. Galvalume offers the best qualities of aluminum-coated (aluminized). and zinc-coated (galvanized) steels. It has barrier corrosion resistance and heat resistance similar to aluminized and good bare edge galvanic protection and forming qualities like galvanized. So, Galvalume on your commercial steel buildings and or arch building will resist rust, the elements and fire while providing a sturdy and protective covering for your commercial steel buildings and or steel arch building. Currently, uses for Galvalume include car mufflers, standing seam roofing, tubing for fences, greenhouses, steel arch buildings and much more. Galvalume offers excellent cost-effectiveness, which we pass on to our customers. Our steel buildings are coated with Galvalume, by virtue of its combined protection of aluminum and zinc, has at least twice the service life, in most atmospheric environments, of conventional galvanized steel with the same coating thickness. Four times in exposure tests in a severe marine environment. Twice as long in a less severe marine location. Six times longer in industrial environments. Three times longer in rural situations. Galvalume steel resists intermediate and high temperatures far more effectively than galvanized steel. 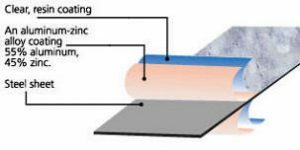 Specifically, Galvalume steel shows no discoloration up to 315Â°C (600Â°F) during continuous or intermittent exposure over a prolonged period. Above this temperature, some discoloration does occur and roughening of the surface is possible. Neither this discoloration nor roughening, however, reduces Galvalume’s resistance to rust. Galvalume maintains its rust-resistance up to 675Â°C (1,250Â°F). Additionally, Galvalume has an excellent heat reflectivity, up to operating temperatures of about 315Â°C (600Â°F). This heat reflectivity makes a steel arch building cooler inside on hot, sunny days.